Beautifully engraved certificate from the Saint Paul and Northern Pacific Railway Company issued in 1894. 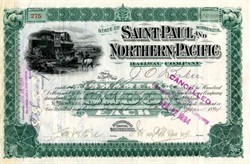 This historic document was printed by International Banknote Company and has an ornate border around it with a vignette of vignette of a steam locomotive passing a man on horseback. This item has the signatures of the Company's President, James B. Williams and Secretary and is over 112 years old. ST. PAUL AND NORTHERN PACIFIC RAILWAY (1889 Report)�Brainerd, Minn., to St. Paul, Minn, 188.76 miles total track, including branches. etc. (steel), June 30, 1886, 218.42 miles. Chartered as Western RR of Minnesota, January 29, 1871 ; road opened from Brainerd to Sink Rapids 60.5 miles, November 1, 1877. The company has a land grant adjacent to the line between Brainerd and Sauk Rapids, of which about 210,000 acres remain unsold. On May 9, 1883, company was reorganized under the present name, and the road leased for 999 years to the N. P. RR. Co., at a rental of 40 per cent. of gross earnings, guaranteed to be equal to bond interest. In 1882, the N. P. RR. Co. purchased, in the interest of this company, 43 feet of the right of way of the St. Paul Minneapolis and Manitoba RR. Co., from Sank Rapids, southeast to Manitoba Junction, and shortly after its reorganization this company began the construction of an extension of its line from Sank Rapids via Manitoba Junction and Minneapolis to St. Paul, which was completed and opened to Minneapolis July 1, 1884 and to St Paul an addition of 12.28 miles February 1, 1856. To pay for the construction of the extension to Minneapolis and St. Paul, for the purchase of real estate, to provide terminal facilities In and between those cities, and for various other purposes authorized by the amended Articles of Incorporation. the company made provision for an issue of $10,000,000 1st mortgage 6 per cents 40-year gold bonds.